Vignette of Equestrian statue of Sir Thomas Munroe, Governor of Madras (1820 – 1827) in centre with a semi circular BANK OF MADRAS above. Denomination in numerals on four corners clock-wise in Arabic, English, Tamil and Telugu. 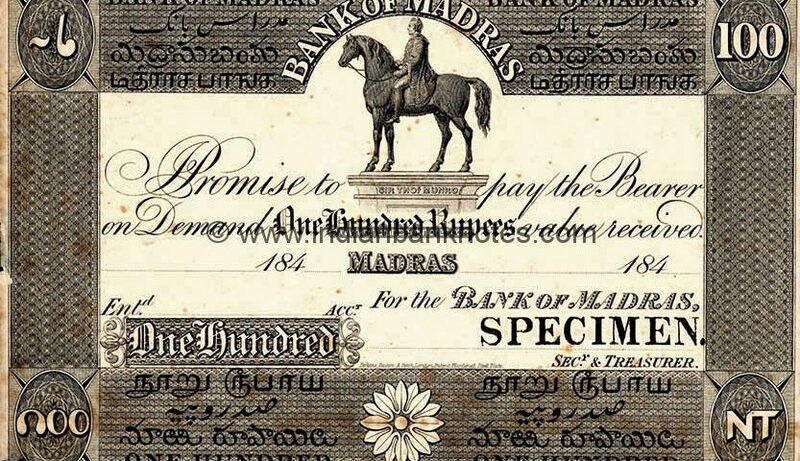 BANK OF MADRAS written in English, Persian, Telugu and Tamil in the upper panel on either side and denomination in words in lower panel on either side separated by a floral motif in centre. Denomination panel in lower left. 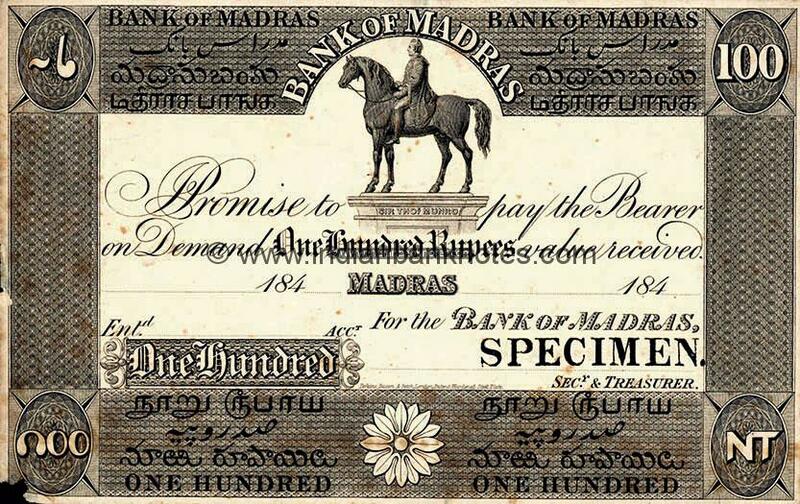 MADRAS in between three digit printed date 184x on either side below promise text. Printed serial number on either side above Promise text. 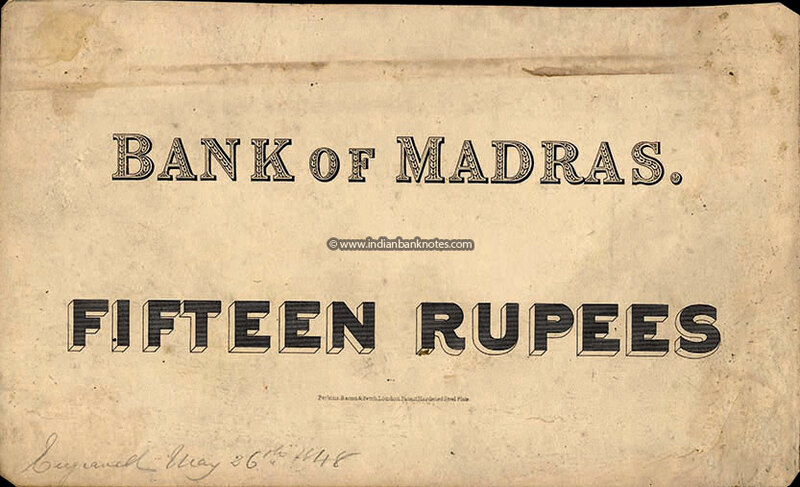 Manuscript signature For the BANK OF MADRAS by Secy. & Treasurer and manuscript signature Entd. by Accountant. Perkins, Bacon & Petch, London – patent hardened steel plate. 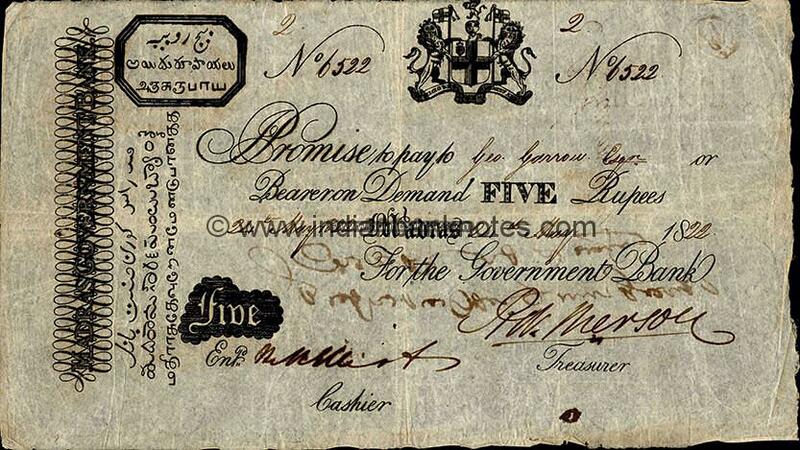 BANK OF MADRAS and denomination in words in English. An angular triple line along all four sides. In centre BANK OF MADRAS in a straight line and below it in Tamil. The equestrian statue was sculpted by Francis Chantrey and erected in 1839. It stands on the Island, immediately to the south of Fort St. George, presently the Army H.Q. The Arabic numeral on top panel is written as a ‘Arabic Siyaq’ number. The numeral system was prevalent in south Asia as ‘Raqm’ - derived from Arabic ‘Siyaq’. This originated from the practice of writing numbers in words in Arabic. These were later shortened as abbreviations and thus represent the numerals as distinct monograms. Printed serial number not seen in specimen notes. 1C.3.1.1 10 Rupees Also as Specimen proof on card of obverse and reverse. 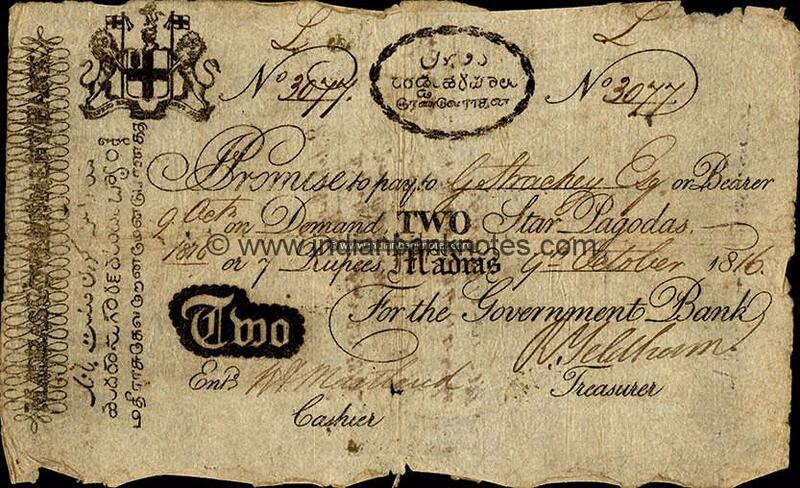 1C.3.1.2 15 Rupees Also as Specimen proof on card of obverse and reverse. 1C.3.1.3 20 Rupees Also as Specimen proof on card of obverse and reverse. 1C.3.1.4 25 Rupees Also as Specimen proof on card of obverse and reverse. 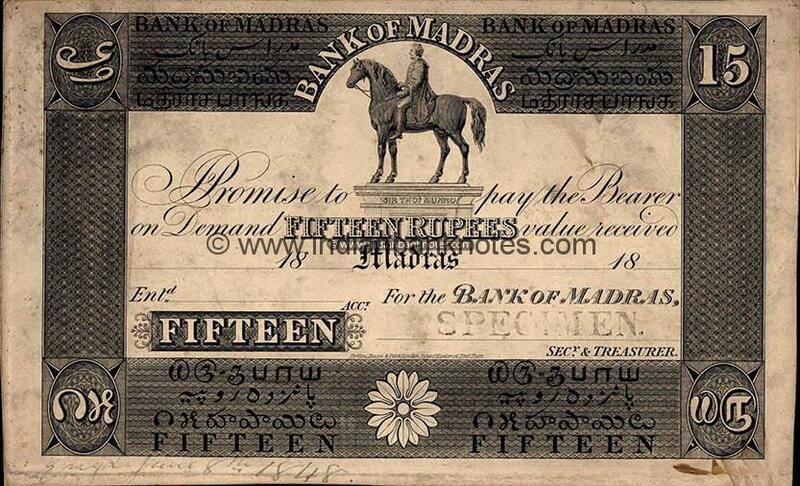 1C.3.1.5 50 Rupees Also as Specimen proof on card of obverse and reverse. 1C.3.1.6 100 Rupees Also as Specimen proof on card of obverse and reverse. 1C.3.1.7 500 Rupees Also as Specimen proof on card of obverse and reverse. 1C.3.1.8 1000 Rupees Also as Specimen proof on card of obverse and reverse. 1C.3.1.9 3000 Rupees Also as Specimen proof on card of obverse and reverse.